San Francisco, meet the i8 Roadster. 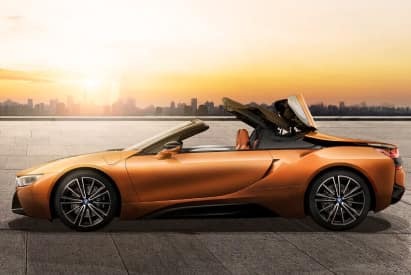 The first-ever BMW i8 Roadster at BMW of San Francisco is the latest – and most advanced – of BMW’s long line of open-top two-seater cruisers. 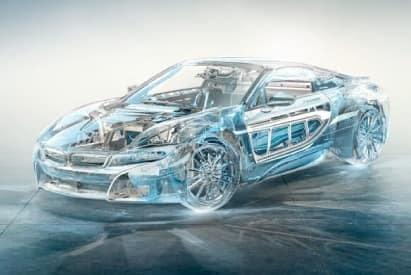 This innovative plug-in hybrid is a beacon of the future, delivering the performance of a sports car with 369 total horsepower, the efficiency of an electric vehicle, and exclusive new colors and upholstery that will make heads turn across the bay! Explore the many new advanced features and capabilities of the new i8 Roadster. 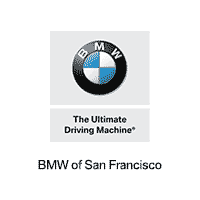 Call (415) 863-9000 to speak with one of our BMWSF i8 Consultants, or fill out the form on this page to schedule your i8 Roadster test drive today! Experience the wind in your hair and the power at your back cruising the BMW i8 Roadster from 0-60 mph in as little as 4.4 seconds! Hybrid sports car all-wheel-drive system with a total power output of 369 hp and 420 lb-ft of torque. 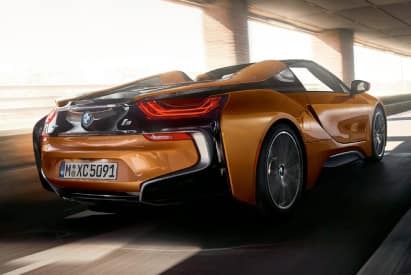 The i8 Roadster features both a BMW TwinPower Turbo 3-cylinder 228-hp and 236 lb-ft of torque engine with high-precision direct injection, as well as an eDrive 141-hp and 184 lb-ft of torque electric motor. BMW i8 Roadster is perfectly designed to derive maximum performance from a high-performance hybrid drive system. 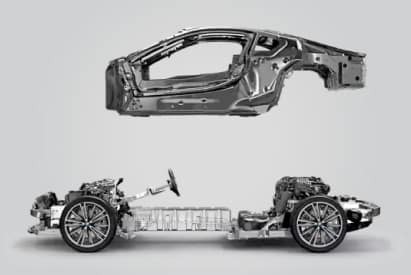 The lightweight two-piece structure sets the i8 Roadster on the cutting edge of automotive design. 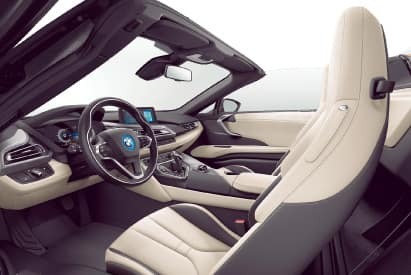 BMW i8 models are upholstered in the finest leather – including available E-Copper Leather Exclusive with Cloth accentuator – and feature the comfort of standard Heated front seats. 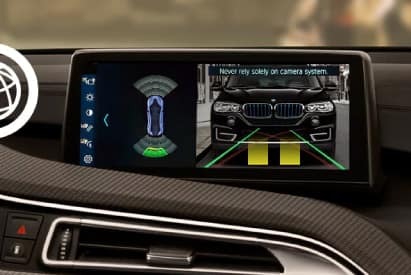 Ultrasonic sensors monitor your surroundings as you maneuver in tight spaces, warning you of obstacles and guiding you into position with audio and visual cues on your iDrive display. The high-quality, all-electric, soft-top opens and closes very quietly in 15 seconds and while travelling at up to 50 km/h. Soft-top stows away in a space-saving perpendicular position, creating additional storage space behind the seats. In the dark, the LED interior lighting ensures a high-quality ambience. 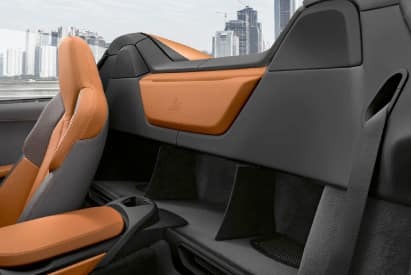 The contour lines of the doors, the instrument panel, the center console and the steering wheel can be optionally and alternately dipped in multiple colors. Surround View gives you a 270-degree all-round panorama view. 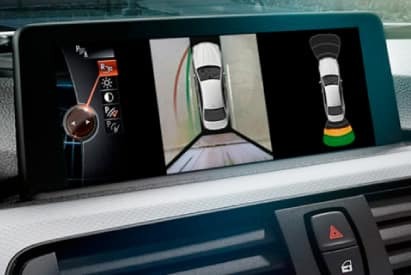 That is made possible by a combination of cameras in the exterior mirrors and a Rear View camera. Two digital cameras on the left and right at the front of the vehicle allow you to see crossing traffic approaching. With the optional Travel Package, retractable dividers and an extra Nappa Leather map pocket are available in addition to the storage space behind the seats. The 2019 i8 Roadster is here! 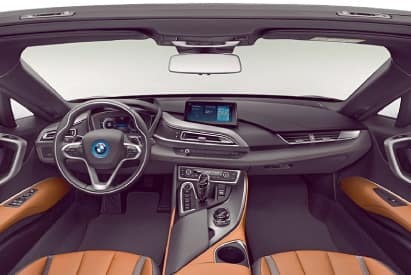 For more information about the latest BMW technologies and features available in the new i8 Roadster, simply give us a call at (415) 863-9000 to setup a Test Drive, so you can experience everything first hand.